The Laser Interferometer Gravitational-wave Observatory (LIGO) has made a third detection of gravitational waves, ripples in space and time, demonstrating that a new window in astronomy has been firmly opened. 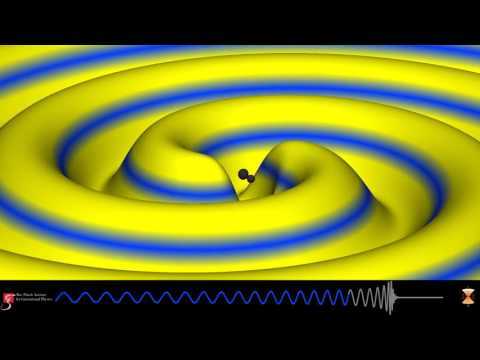 As was the case with the first two detections, the waves were generated when two black holes collided to form a larger black hole. The newfound black hole has a final mass about 49 times that of our sun. This fills in a gap between the masses of the two merged black holes detected previously by LIGO, with solar masses of 62 (first detection) and 21 (second detection). "We have further confirmation of the existence of stellar-mass black holes that are larger than 20 solar masses—these are objects we didn't know existed before LIGO detected them," says MIT's David Shoemaker, the newly elected spokesperson for the LIGO Scientific Collaboration (LSC), a body of more than 1,000 international scientists who perform LIGO research together with the European-based Virgo Collaboration. "It is remarkable that humans can put together a story, and test it, for such strange and extreme events that took place billions of years ago and billions of light-years distant from us. The entire LIGO and Virgo scientific collaborations worked to put all these pieces together." The new detection occurred during LIGO's current observing run, which began November 30, 2016, and will continue through the summer. LIGO is an international collaboration with members around the globe. Its observations are carried out by twin detectors—one in Hanford, Washington, and the other in Livingston, Louisiana—operated by Caltech and MIT with funding from the National Science Foundation (NSF). LIGO made the first-ever direct observation of gravitational waves in September 2015 during its first observing run since undergoing major upgrades in a program called Advanced LIGO. The second detection was made in December 2015. The third detection, called GW170104 and made on January 4, 2017, is described in a new paper accepted for publication in the journal Physical Review Letters. A mathematical simulation of the warped space-time near two merging black holes. The simulation is consistent with LIGO's observation of the event dubbed GW170104. The colored bands are gravitational-wave peaks and troughs, with the colors getting brighter as the wave amplitude increases. The newest observation also provides clues about the directions in which the black holes are spinning. As pairs of black holes spiral around each other, they also spin on their own axes—like a pair of ice skaters spinning individually while also circling around each other. Sometimes black holes spin in the same overall orbital direction as the pair is moving—what astronomers refer to as aligned spins—and sometimes they spin in the opposite direction of the orbital motion. What's more, black holes can also be tilted away from the orbital plane. Essentially, black holes can spin in any direction. "This is the first time that we have evidence that the black holes may not be aligned, giving us just a tiny hint that binary black holes may form in dense stellar clusters," says Bangalore Sathyaprakash of Penn State and Cardiff University, one of the editors of the new paper, which is authored by the entire LSC and Virgo collaborations. "We're starting to gather real statistics on binary black hole systems," says Keita Kawabe of Caltech, also an editor of the paper, who is based at the LIGO Hanford Observatory. "That's interesting because some models of black hole binary formation are somewhat favored over the others even now and, in the future, we can further narrow this down." The study also once again puts Albert Einstein's theories to the test. For example, the researchers looked for an effect called dispersion, which occurs when light waves in a physical medium such as glass travel at different speeds depending on their wavelength; this is how a prism creates a rainbow. Einstein's general theory of relativity forbids dispersion from happening in gravitational waves as they propagate from their source to Earth. LIGO did not find evidence for this effect. "It looks like Einstein was right—even for this new event, which is about two times farther away than our first detection," says Laura Cadonati of Georgia Tech and the Deputy Spokesperson of the LSC. "We can see no deviation from the predictions of general relativity, and this greater distance helps us to make that statement with more confidence." "The LIGO instruments have reached impressive sensitivities," notes Jo van den Brand, the Virgo Collaboration spokesperson, a physicist at the Dutch National Institute for Subatomic Physics (Nikhef) and professor at Vrije Universiteit in Amsterdam. "We expect that by this summer Virgo, the European interferometer, will expand the network of detectors, helping us to better localize the signals." "With the third confirmed detection of gravitational waves from the collision of two black holes, LIGO is establishing itself as a powerful observatory for revealing the dark side of the universe," says David Reitze of Caltech, executive director of the LIGO Laboratory. "While LIGO is uniquely suited to observing these types of events, we hope to see other types of astrophysical events soon, such as the violent collision of two neutron stars." LIGO is funded by the NSF, and operated by MIT and Caltech, which conceived and built the project. Financial support for the Advanced LIGO project was led by NSF with Germany (Max Planck Society), the U.K. (Science and Technology Facilities Council) and Australia (Australian Research Council) making significant commitments and contributions to the project. More than 1,000 scientists from around the world participate in the effort through the LIGO Scientific Collaboration, which includes the GEO Collaboration. LIGO partners with the Virgo Collaboration, a consortium that includes 280 additional scientists throughout Europe supported by the Centre National de la Recherche Scientifique (CNRS), the Istituto Nazionale di Fisica Nucleare (INFN), and Nikhef, as well as Virgo's host institution, the European Gravitational Observatory. Additional partners are listed at http://ligo.org/partners.php. Artist's conception shows two merging black holes similar to those detected by LIGO. The black holes are spinning in a non-aligned fashion, which means they have different orientations relative to the overall orbital motion of the pair. LIGO found hints that at least one black hole in the system called GW170104 was non-aligned with its orbital motion before it merged with its partner. LIGO has discovered a new population of black holes (blue) with masses that are larger than what had been seen before with X-ray studies alone (purple). The three confirmed detections by LIGO (GW150914, GW151226, GW170104), and one lower-confidence detection (LVT151012), point to a population of stellar-mass binary black holes that, once merged, are larger than 20 solar masses—larger than what was known before. Artist's conception shows two merging black holes similar to those detected by LIGO. The black holes—which will ultimately spiral together into one larger black hole—are illustrated to be orbiting one another in a plane. The black holes are spinning in a non-aligned fashion, which means they have different orientations relative to the overall orbital motion of the pair. There is a hint of this phenomenon found by LIGO in at least one black hole of the GW170104 system. This three-dimensional projection of the Milky Way galaxy onto a transparent globe shows the probable locations of the three confirmed LIGO black-hole merger events—GW150914 (blue), GW151226 (orange), and the most recent detection GW170104 (magenta)—and a fourth possible detection, at lower significance (LVT151012, green). The outer contour for each represents the 90 percent confidence region; the innermost contour signifies the 10 percent confidence region. This map illustrates how the addition of the Virgo detector, scheduled to come online this summer, could improve the localization of sources of gravitational waves. The map shows the estimated locations of the four black-hole merger events detected by LIGO to date (including one event seen at lower significance), after including hypothetical Virgo data. Outer contours represent the 90 percent confidence region; innermost contours signify the 10 percent confidence region.